In Moscow artistic life, Ilya Mashkov appeared at the beginning of the twentieth century. He was the author of the creation of a creative association of avant-garde artists, which was called the “Jack of Diamonds”. His works were exhibited at exhibitions until 1917, until the collapse of the union. In 1911, the “Self-portrait” was born at the very beginning of the artistic path of the author. Art critics call his first works the most powerful and popular. Over time, the painter began to write in more traditional styles. “Self-portrait” appeared during the search for new forms and creative techniques. The canvas refers to the style of Fauvism. Looking at the canvas, the viewer will immediately see the features inherent in Fauvism – the artist used simple but rich color solutions, the forms are lined with expressive and vivid color, all the outlines of the figure are summarized and underlined simultaneously. We can not find in the picture chiaroscuro and linear perspective. It seems that the picture is written as if the background of it is a sign at the fair. Steamers appear before the viewer, bright waves of a bluish color, not real, but decorative, sailboats. A painter is looking at us from the canvas, as if he is admiring himself, self-confident with a haughty look. He is dressed in a not very cheap fur coat, hat. We see his self-confident pose, dandy mustaches. 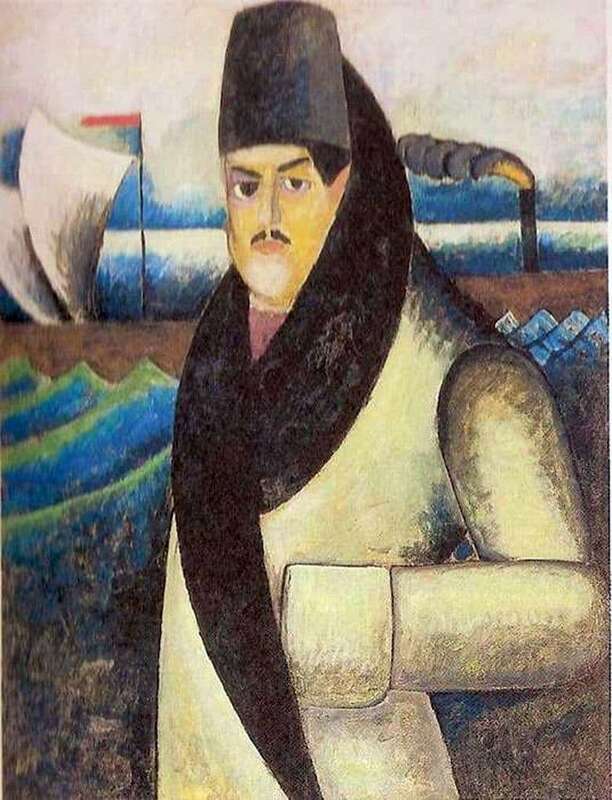 If we did not know that the painter is depicted in the picture, that this is his self-portrait, one would have thought that Mashkov painted a portrait of a rich gentleman. When looking at the “Self-portrait” the viewer will create a mood with a sense of celebration, slightly elevated. Mashkov was always considered a practical person with a positive world view, very active. Therefore, looking at his works, we do not stand aside, we receive through them his spirit of optimism and joy, we are charged with the love of the author for life.